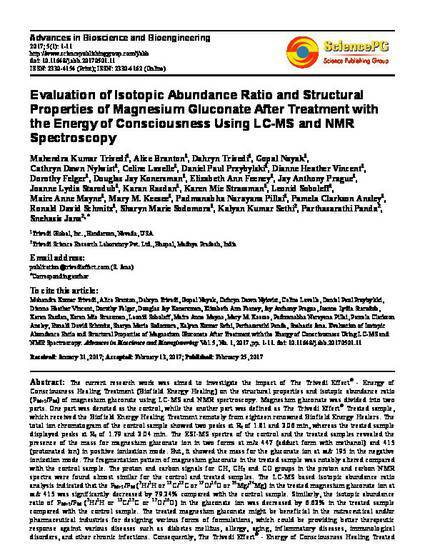 The current research work was aimed to investigate the impact of The Trivedi Effect® - Energy of Consciousness Healing Treatment (Biofield Energy Healing) on the structural properties and isotopic abundance ratio (PM+1/PM) of magnesium gluconate using LC-MS and NMR spectroscopy. Magnesium gluconate was divided into two parts. One part was denoted as the control, while the another part was defined as The Trivedi Effect® Treated sample, which received the Biofield Energy Healing Treatment remotely from eighteen renowned Biofield Energy Healers. The total ion chromatogram of the control sample showed two peaks at Rt of 1.81 and 2.06 min, whereas the treated sample displayed peaks at Rt of 1.79 and 2.04 min. The ESI-MS spectra of the control and the treated samples revealed the presence of the mass for magnesium gluconate ion in two forms at m/z 447 (adduct form with methanol) and 415 (protonated ion) in positive ionization mode. But, it showed the mass for the gluconate ion at m/z 195 in the negative ionization mode. The fragmentation pattern of magnesium gluconate in the treated sample was notably altered compared with the control sample. The proton and carbon signals for CH, CH2 and CO groups in the proton and carbon NMR spectra were found almost similar for the control and treated samples. The LC-MS based isotopic abundance ratio analysis indicated that the PM+1/PM (2H/1H or 13C/12C or 17O/16O or 25Mg/24Mg) in the treated magnesium gluconate ion at m/z 415 was significantly decreased by 79.24% compared with the control sample. Similarly, the isotopic abundance ratio of PM+1/PM (2H/1H or 13C/12C or 17O/16O) in the gluconate ion was decreased by 6.62% in the treated sample compared with the control sample. The treated magnesium gluconate might be beneficial in the nutraceutical and/or pharmaceutical industries for designing various forms of formulations, which could be providing better therapeutic response against various diseases such as diabetes mellitus, allergy, aging, inflammatory diseases, immunological disorders, and other chronic infections. Consequently, The Trivedi Effect® - Energy of Consciousness Healing Treated magnesium gluconate would be more helpful for understanding the enzymatic reactions as well as assist in the designing of the novel potent enzyme inhibitors by applying its kinetic isotope effects.